A new sign for Mary Jane Lee Park. 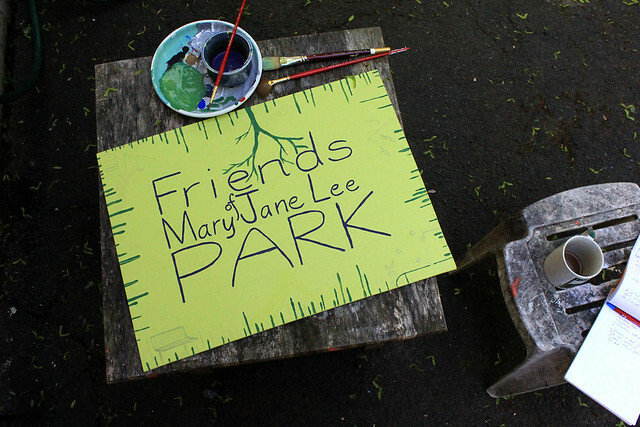 I’m in the middle of painting a new sign for The Friends of Mary Jane Lee Park. 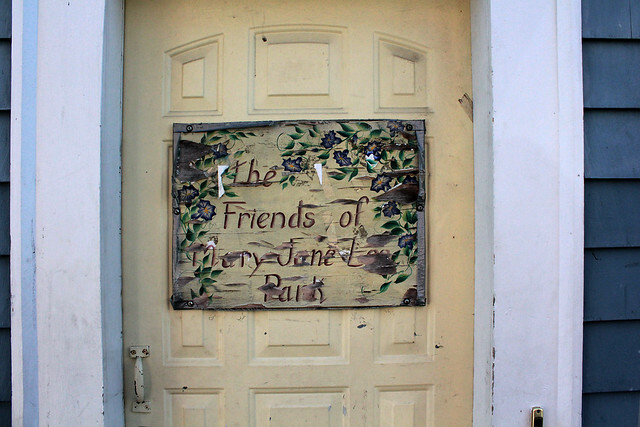 Several weeks ago I was walking by Doreen Thomas’ house – The Friends of Mary Jane Lee Park headquarters – and I noticed that the long New England winter had not been kind to the Friends’ sign. I’ve been slowly working on a new sign since – acquiring a wood board from the local lumber yard, selecting a spring chartreuse as background color, practicing my lettering. I thought I would use the completion of the sign as a good time to write this article: I could give it to Doreen, and perhaps get a photo of the new sign on the door. This morning, I realized that the ideal end, a moment of closure for my projects in Mary Jane Lee Park, may never come. And I don’t want an end to come. The middle is a much more appropriate place to write this final installment of How to Make Friends with a Park. Last fall, I set out to “make friends” with Mary Jane Lee Park in The Point neighborhood of Salem, Massachusetts. I didn’t think about what that might mean for me. I was too much of an outsider looking for a way in to consider what may happen if ever I got “in.” All I hoped for was to get to know some regulars who would offer insights that would fit nicely into a three-installment story arc. I would write these posts and reflect on lessons learned and apply them to future ventures. What actually happened was that I did, in fact, make friends with this park. This is why more than six months have passed between my second post and this third. Friendship is not a passive enterprise; it inspires action: give, take, confront, risk, respond, and enjoy. Chairs in Mary Jane Lee Park. Since last fall, a thousand and one things have happened. And as soon as one thing is done, something new is on the horizon. Now, don’t imagine these are grand things. They are very small. First, I wanted to give something. I painted nine old chairs blue and left them in the park so that kids could play with them. We hosted a poetry reading as a way to commemorate gifting chairs to a park that many residents spoke of as asset-poor – the water fountain doesn’t work, trash cans are missing, the nets on the basketball hoops are torn, and benches were removed to discourage night-time use. The blue chairs did not survive long, but so many stories poured forth from that experiment. On sunny days, local photographer Pamela Joye found wonder as she captured small children at play in the park. On sunny days, neighborhood kids grow up in the park. Easter egg hunt in the park. 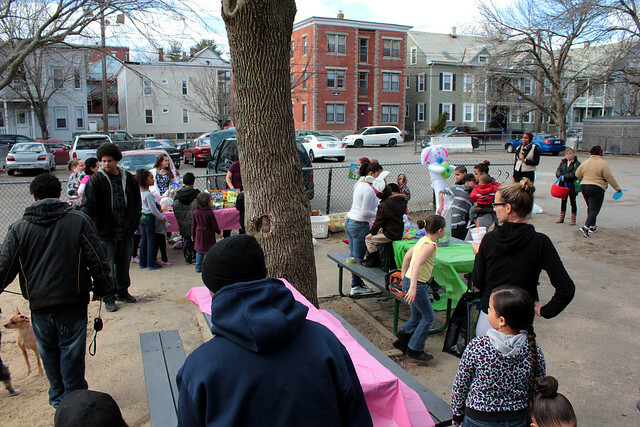 The day before Easter, The Friends of Mary Jane Lee Park hosted an Easter Egg hunt. I used the egg hunt as an opportunity to survey the adults on how they would improve the park. So I drew up a survey and walked to the park. I was surprised at so many willing responses and soon ran out of surveys. Last month, when Boston was on lockdown as law enforcement searched for the Marathon bombers, many people in suburbs like Salem had the day off of work because they couldn’t get to their jobs in the city. I spent my day off in the park. Doreen’s son William, some friends, and I put up a bulletin board in the park that, surprisingly, is still there. Many, many conversations have been had. Two days ago I saw new nets on the hoops – a gift from the city. So the small and ephemeral has kept me glued to this hodgepodge patch of land for months now. From the beginning, I did meet people to chronicle. I met Doreen Thomas who has been the official president of the unofficial (aspiring non-profit), Friends of Mary Jane Lee Park. 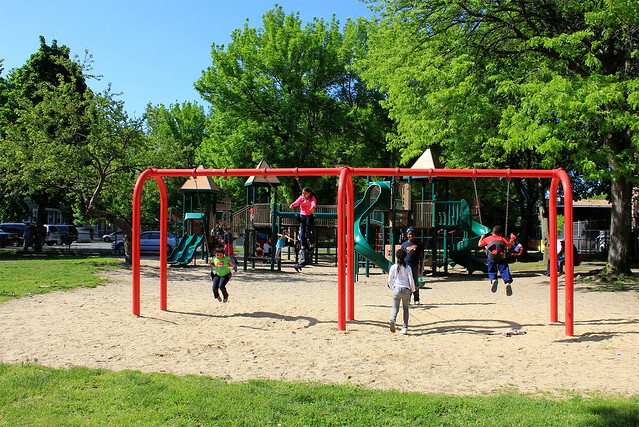 I met Kara and Jesse and their children – recent transplants to the neighborhood in need of a place to play who had just started coming to the park and saw it as one of the neighborhood’s main assets. I am sad to have lost contact with Kara in spite of many efforts to reconnect. May in Mary Jane Lee Park. I remember watching my daughter, who was three years old at the time, running through the grass at Mary Jane Lee Park. It was the first time I saw her run so fast. Her little tiny legs pumping as hard as she could. 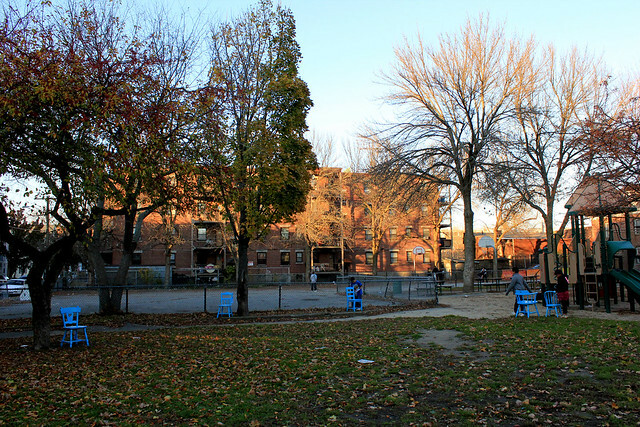 When I first met this park, I wondered: What can a seemingly simple park teach about this neighborhood? The big story is not a perfect narrative, but the thousand small actions that sustain it all over time: the half-finished sign, the open invitation, new nets on the hoops.